For this edition of “Fish Reads” we bring you a change of pace: a book that’s not about Harleys! Although it’s not specifically stated anywhere in the book, Pat Hahn’s Classic Motorcycles: The Art of Speed is a really nicely photographed collection of bikes that seemingly all live in the Solvang Vintage Motorcycle Museum. If you’re unfamiliar with the Museum and its owner Virgil Elings, you owe yourself a trip there. 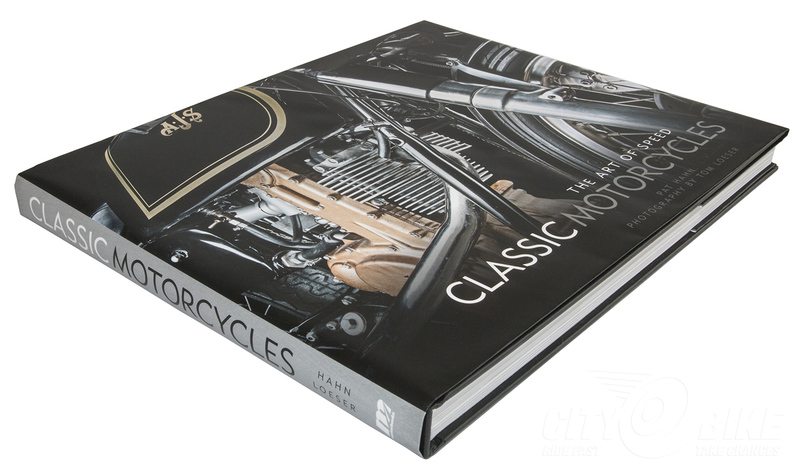 I’m no stranger to picture books, but Classic Motorcycles definitely stands out aesthetically. The photographer, Tom Loeser, included a descriptive and informative section detailing the “light painting” equipment and processes used to photograph the bikes in this book. In this age of camera phones and the resulting seas of everyone’s-a-photographer, uncomposed, poorly shot picshurs, it’s a refreshing and worthwhile read on serious technique. And the effort put in truly pays off here. These fascinating photographs are divided into three eras: The Experimental Years, Finding the Groove, and The Art of Speed. The subject matter in the first chapter will have you scratching your head at the bizarre motorcycles that never quite caught on; for example, the 1915 Militaire Deluxe, with its H-pattern transmission, wooden wagon wheels, and hub-steered front wheel. And we can’t forget the Megola with its radial engine mounted inside the front rim. Complete with direct drive coupling and no starter. It’s shockingly beautiful while still being completely batty. Part two has more traditional looking bikes, including a personal favorite: the Brough Superior. The featured bike here is a 680cc Black Alpine, and it is truly exquisite, from the twin headlights to the stacked fishtail exhaust. The outside-hinged control levers are such a neat look as well. There’s a 1949 Crocker featured too, and the Crocker story is well explained—a nice bit of history. It’s also a nice bike to look at. Part three brings some of the most amazing racing machines ever made, including the MV Agusta triple that won “Spirit of the Quail” at the 2016 Quail Motorcycle Gathering. Virgil himself was there to give a brief history of the bike and shared a reminder that while it was a beautiful vintage bike, it was a race bike first. This particular bike was not a winner, so no matter how rare, not winning made it pretty lousy and it was worth nothing to the people who were trying to race it. Also in that vein is the Honda NR750, an oval-piston V4 sportbike with obvious ties to the more well-known VFR. The single-sided swingarm and upside-down forks which are now sorta ho-hum were a big deal in 1992, but the elliptical pistons with two connecting rods per bore never really worked out. It was good for 125 hp at 14,000 RPM. Then there’s the Britten V1000, still a benchmark for engineering and design. From the carbon fiber wheels to its 160 hp moving just 300 pounds of bike, the Britten is truly the Art of Speed. Classic Motorcycles is a compelling read for vintage buffs, with step-by-steps lessons to help grasp how far we’ve come in terms of design and technology. The examples of these amazing bikes are really some of the best in the world. Even better, we’re within a day’s ride of Solvang and the mind-blowing experience of walking in and seeing the NR and Britten side-by-side. So get the book, yes, but also get thee to Solvang to see these bikes in person. $50. Hardcover, 224 pages,12” x 9.75”. Learn more and get your own copy at Amazon.com. This story originally appeared in our April 2017 issue, which you can read in all its original high-res glory here.